The Andronikov Monastery (Russian: Андро́ников монасты́рь, Спа́со-Андро́ников монасты́рь, or Андро́ников Нерукотво́рного Спа́са монасты́рь), located on the left (eastern) bank of the Yauza River, is one of several fortress-monasteries on the southeastern outskirts of Moscow, Russia. The monastery's most famous monk was the great fourteenth century icon painter, Andrei Rublev who was buried in the monastery crypt. Metropolitan Alexei of Moscow vowed to establish a monastery and cathedral in Moscow if he survived a severe storm that he encountered at sea, in 1358, on his journey back to Moscow from Constantinople, and that he would name it for the saint on whose feast day he arrived safely in Moscow. The day he arrived in Moscow was a day dedicated to Our Savior. In 1361, he founded the monastery dedicated to Our Savior (in Russian: Spas) on the bank of the Yausa River. When Metr. Alexei was later called to treat the ailing wife of the Khan of the Kypchak Horde at Sarai, he left the monk Andronik in charge of the monastery. He became the first abbot of the monastery. Subsequently, the monastery took his name as well: (‘‘Spaso-Andronikov Monastyr’‘). Between 1425 and 1427 the present Cathedral of the Savior, the oldest building in Moscow, was built under the leadership of the abbot Alexander. The new stone building replaced the earlier wooden cathedral. The interior of the cathedral was decorated by frescos painted by St. Andrei Rublev. Rublev’s work in the cathedral was among the last major works done by him before his repose in 1430. During the seventeenth century the white stone crenellated walls and towers were built around the monastery during the time that the circle of walled monasteries around Moscow was strengthen. During this time the ornately decorated residence for the abbot was also built. Over the years other additions were made to the monastery. The Moscow Baroque styled Church of the Archangel Michael, built in 1694 along the west wall of the monastery, as part of a collections of different buildings assembled since the sixteenth century. The church was commission by Peter I’s mother-in-law, in honor of her grandson’s birth. This ensemble includes a two story refectory built between 1504 and 1506 that abuts the Chapel of St. Michael the Archangel. 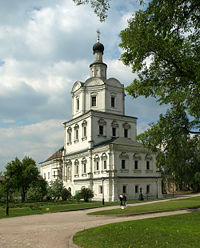 During the last decade of the eighteenth century, the Moscow architect Rodion Kazakov was commission to build a bell tower for the monastery. The tower he planned was taller than any other in Moscow, including the Belfry of Ivan the Great in the Moscow Kremlin. He was directed by Tsar Paul I to reduce its height and that no other structure was be built higher than the belfry in the Kremlin. The approximately 315 foot (72.5 meter) Andronikov belfry was destroyed by the Bolsheviks in 1930. 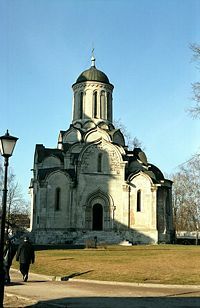 During the sixteenth century the monastery was popular with the Old Believers. In 1653, the priest Avvakum was held under arrest at the monastery. The cemetery at Andronikov Monastery also began a popular resting place for many of the aristocratic elite of Moscow. Among those buried in the cemetery were the parents and relatives of tsarina Evdokia Lopukhina as well as Baryantinsky and Trubetskoy. The monastery came to know difficult times over the centuries. It was ransacked in the years 1571, 1611, and 1812. In September 1812, French soldiers under Napoleon spent two days plundering the monastery before setting it afire. After the Bolshevik assumption of power in 1917, the monastery was closed. 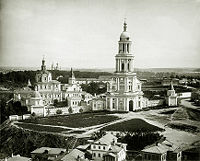 In 1919, the buildings of the monastery was used as quarters for workers in the Rogozhsko-Simoovsky district in which the monastery was located. The cemetery was used as a football field. In 1930s, the majestic bell tower and the Savior Cathedral in the Woods were torn down. Various restoration efforts were started at the monastery after World War II. In 1947, the cemetery of the monastery was designated a national monument. In 1949, in accordance with a proposal by the Academician Igor Graber, a museum of old Russian paintings was begun on the monastery ground. Restoration was ed by D. I. Arsenishvili, who virtually lived in the vestibule of the church while work was ongoing. In 1960, the Andrei Rublev Central Museum of Ancient Russian Culture and Art was opened, in honor of the 600th anniversary of his birth. While the museum does not contain any of Rublev’s works,it does a collection of fifteenth century works of the Rublev School. In 1989, the monastery was returned to the Russian Orthodox Church. On July 17, 1989, a divine liturgy was served on the first anniversary of the glorification of Andrei Rublev as a saint. The cathedral of the monastery now functions as a parish church. While old records note that St. Andrei was buried in the cathedral, the location of the grave has been lost long ago. Thus, the myth of it being lost after the Bolshevik revolution is just that, a myth. At the end of the eighteenth century was the time a slab of his tomb was seen. Records noted that his grave may have been buried under the bell tower that was built at the start of the nineteenth century, the tower that was destroyed in the 1930s. This page was last edited on October 11, 2009, at 18:59.